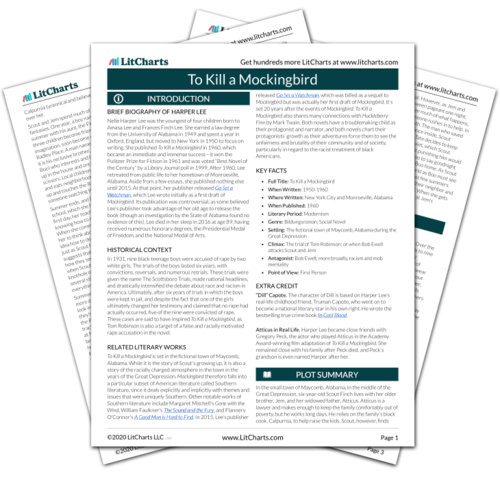 Instant downloads of all 942 LitChart PDFs (including To Kill a Mockingbird). 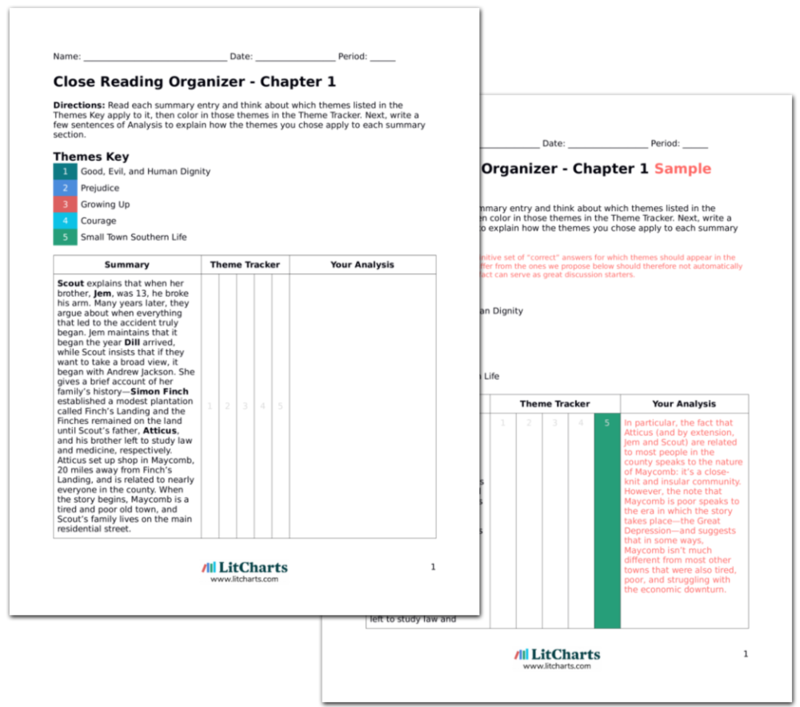 LitCharts assigns a color and icon to each theme in To Kill a Mockingbird, which you can use to track the themes throughout the work. That winter it snows in Maycomb for the first time since 1885. Scout and Jem use dirt covered with snow to make a snowman that looks remarkably like Mr. Avery, an unfriendly neighbor. Atticus is impressed, but then sees the resemblance and kindly asks them to disguise the snowman a little bit better. This is another instance of Atticus protecting the dignity of another person. The snow makes it cold, and everyone keeps their fires blazing. That night Miss Maudie's house catches fire. Everyone in the neighborhood pitches in to save what they can, but the house burns to the ground. Miss Maudie says the house was too big anyway. Here's Maycomb at its best: neighbors helping each other. But the fire also marks the end of innocence. The rest of Mockingbird is dominated by the trial of Tom Robinson. Scout and Jem watch the fire from in front of the Radley house down the street. When they come inside, Scout discovers that someone has draped a blanket over her shoulders. Jem says it must have been Boo Radley who gave her the blanket. Jem has grown out of seeing Boo as a monster; he can imagine Boo being kind. Boo's protection of Scout foreshadows future protective action. Florman, Ben. "To Kill a Mockingbird Chapter 8." LitCharts. LitCharts LLC, 22 Jul 2013. Web. 18 Apr 2019. Florman, Ben. "To Kill a Mockingbird Chapter 8." LitCharts LLC, July 22, 2013. Retrieved April 18, 2019. https://www.litcharts.com/lit/to-kill-a-mockingbird/chapter-8.